Here it is! I am thrilled with my second Primrose Path doily! I'm glad I paid attention to where the color change occurred when I started each motif. I think it makes a big difference. I would show it next to the first doily, but my friend Nancy asked me for a doily to hold an angel planter that was given to her as a get well gift. She's been ill since February, and I'm glad she asked me for one of my tatted doilies. 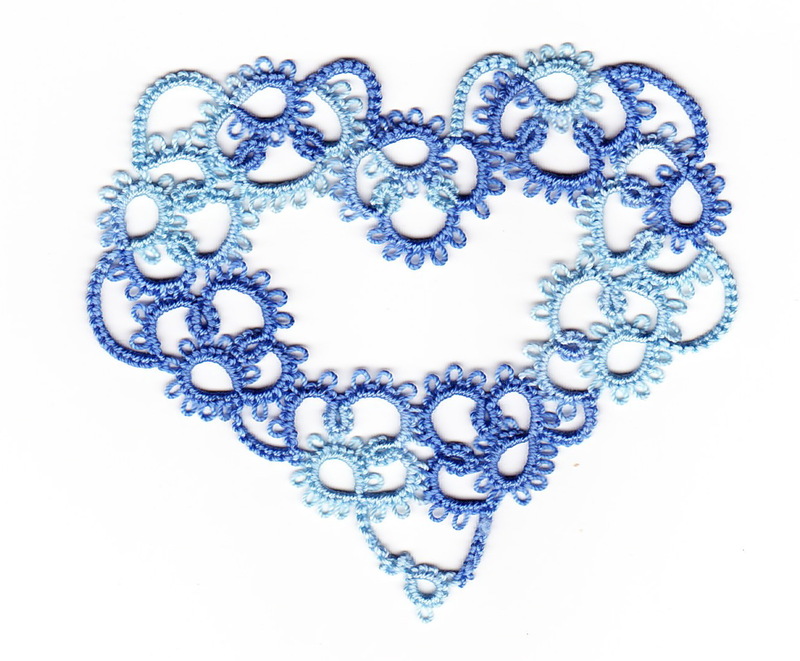 Dave noticed that I was having trouble finding a place to photograph my tatting, so he made this table for me. 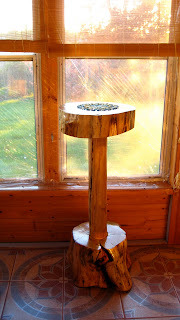 He got the idea from a table he saw at a floral shop. He helped cut a tree down at a friend's house last fall, and he spirited the wood pieces into the basement without my knowledge. I never go down to the basement any more, so he knew the project would remain a secret! He surprised me with it on Sunday. I'll have to practice taking pictures in different lighting, so I guess I'd better keep tatting! I think this may be the perfect home for my newly finished doily. The colors go well with my little creamer from Tom Jones Pottery. Hmm... maybe I should have dusted first! I actually finished Stacy's pillow Sunday afternoon, but I had taken my camera to school for a project and forgot to bring it home. Looking at the picture, it's a bit off center, but I don't think Stacy will mind. I thought of adding some more embellishment, but sometimes less is more! for Stacy's ring bearer's pillow has led me to the conclusion that I should usually go with my initial instinct! 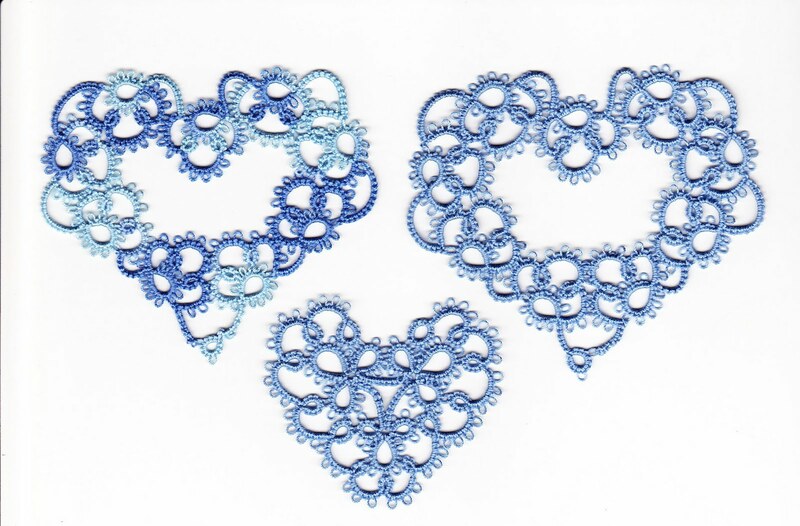 The top left heart is the first one I made (Queen of Hearts from Tatting with Visual Patterns by Mary Konior). 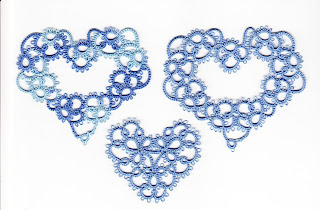 I love the shades of blue, but Stacy prefers a solid color, so I'll be using the top right heart. 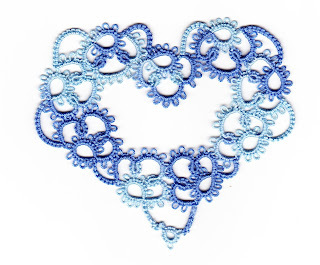 I love the heart on the bottom from Tatting by Cathy Bryant, but it's a little too big for using in the corners of the pillow, and it doesn't have an open center to fit the center of the pillow. You'll see what I mean when I finish the pillow... hopefully by the end of today! After seeing Jon's progress with the Primrose Path doily, I thought I should show how far I've progressed with my second one. I'm amazed at how much more I can accomplish when I'm home (we're on spring break this week). I really like the green section, and I definitely see the value of paying attention to where color changes take place in the motifs. For some reason, this doily is not lying as flat as the first one did. I'm guessing that it has to do with the tension of my stitches. Thank goodness for blocking boards! A friend asked me to decorate a ring bearer's pillow for her daughter's wedding, and I immediately thought of Mary Konior's Queen of Hearts from Tatting with Visual Patterns. I'm not sure how I'll use it yet, but I will have the pillow finished by the end of this week. The thread is Oren Bayan #058, size 50. I see an oopsie at the bottom. I guess I'll have to block it! Well, it's complete except for proper blocking. I was so excited to finish this, that I performed a quick steam job and placed it on the scanner. I didn't even take time to place it neatly on the scanner bed. I just couldn't help myself! I love everything about this doily... the pattern, the thread, the size. Now I'll have to complete the second one where I pay attention to the color changes. I have a few other projects I need to finish first, though. Oh, how I wish I could stay home and tat all day long! It is an early dismissal day, though, so I can't complain too much! 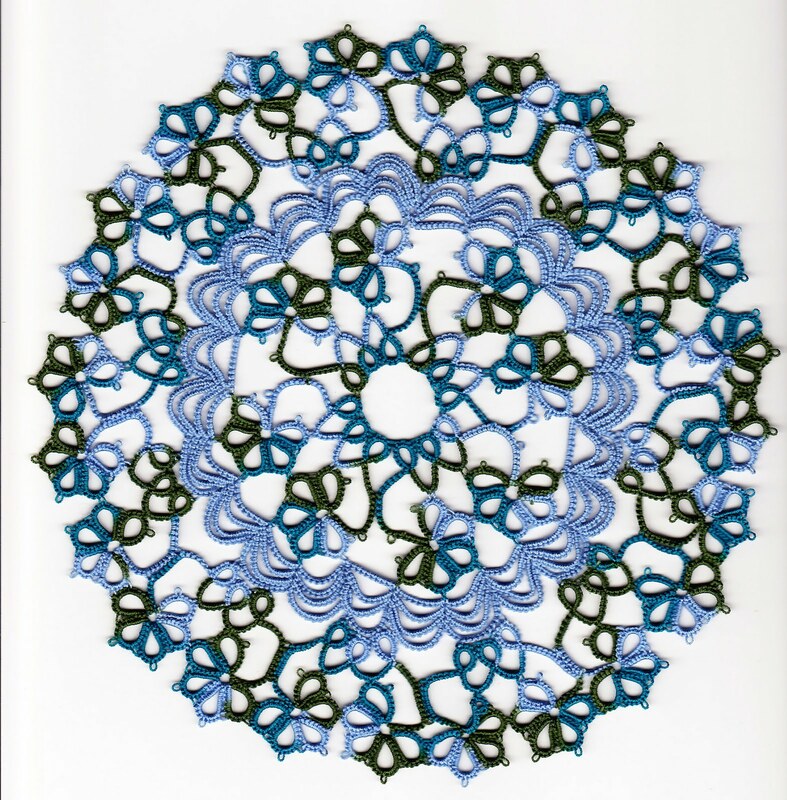 I'm hoping that Carol will cook dinner or go for carry-out so that I can spend some quality tatting time today! I"m slowly but surely making progress on my Primrose Path doily. Have I mentioned that I love this pattern? It's challenging enough that I don't fall asleep while working on it, but simple enough that I can work on it while I'm watching t.v. or listening to music. I love the colors I've chosen. 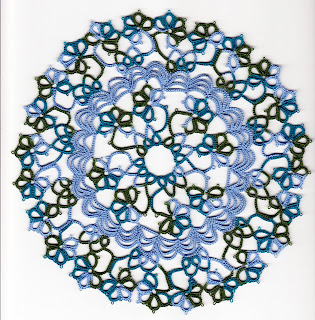 This is my "trial" doily, where I haven't paid attention to where I started tatting the floral motifs with the variegated thread. When I get to that one, I'm thinking of using green for the second section, even though it's a lighter shade. Or, maybe I should stick with the blue. What do you think? I was lucky enough to win a tatted bookmark from my friend Laura. Isn't it gorgeous? What I wasn't expecting was the bonus of two hankies and two bobbins! Thank you, Laura! How did you know I've been thinking about hanky edgings and bobbin lace?